These guys made some pretty impressive projects out of cigar boxes. My favorite is the third place winner who made a cigarette stand by gluing boxes together and then turning them on a lathe to make a round pole. Pretty crafty. 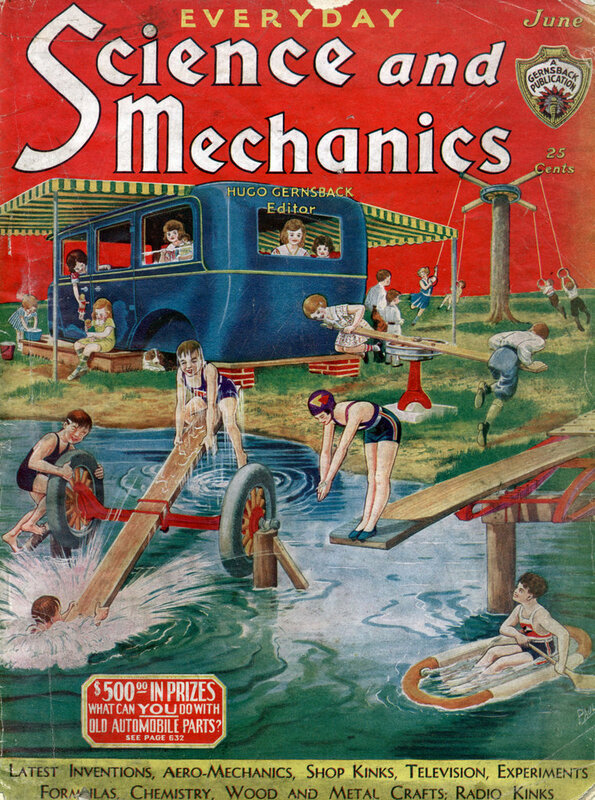 THE BOXCRAFT CONTEST, originated by the publishers of this magazine, has taken the country by storm. So adept are the contestants in this contest becoming, that they think nothing of bending cigar-box wood, and working the bent pieces into the designs of their construction. We might add a word of caution at this point. Some of the many models which we receive are not properly packed, and arrive in a broken condition. Great care should be taken in securing the model within the package, so that it will not be damaged in transit. In addition, we cannot impress to strongly upon the minds of the makers of Boxcraft articles, the absolute necessity of using a waterproof glue (or some glue which will not soften), in their constructions. It is not a pleasant sight, to watch a beautiful construction fall apart on the first humid day, or warp out of shape to such an extent that its original form may no longer be recognized. Waterproof glues are no more expensive than the ordinary types. Usually, they do not require heating. Some are supplied dry, others are in liquid form and are ready for use. These glues are as easily handled as mucilage. If used, they will keep your model togetherâ€”and this is important. For those who would like to bend the wood for Boxcraft entries, we might suggest that a kettle of boiling water makes a good steamer. The water in the kettle is kept at a level below the inside opening of the spout, and the wood to be bent is held over the steam exuding from the spout, until such time as it becomes easily pliant. Soaking the wood in hot water will also allow the wood to be bent around pegs or nails, driven into a board; the piece being held in the bent position until it is thoroughly dry. Several coats of shellac, varnish, paint or even wax, will prevent moisture from penetrating the wood and thus prevent destruction of the bent shape. In this, the second group of awards, the judges decided to award the first prize to a splendid example of Boxcraft work, made by Arthur J. Abrahamson, of Fosston, Minn., for the nut tray and server illustrated above. “When I first noticed the Cigar Box Contest, I became interested and began gathering a few cigar boxes. After pulling them apart I had just a few plain pieces of wood that one would otherwise splinter for kindling. My first plan was to make some kind of a luncheon tray, but it was not until I had the article half completed that I thought of changing it to a nut server. “I first made the rectangular piece, then glued a picture-frame-like construction on the bottom; next I made the two-legged end-pieces and the middle part of the handle, which is partly mortised into the end-pieces. Then I mortised the legs into the corners of the bottom-piece, using glue and a small nail. In each corner I assembled the end-pieces including the part of the handle. Next I made the side and end-pieces for the bottom tray, beveling the edges to fit. Before glueing them, I sawed a notch 1/8″ deep, lengthwise in each end, to receive a strip of iron (about 26 gauge, 1/4″ by 1-3/8”); eight of these were used for the purpose of lining-up the corner pieces, which also have notches sawed in the joining edges. “The bottom of the top-tray was next made. The side pieces were soaked in hot water for a half hour. Then I fitted a temporary brace in the center and glued the sides to the bottom and clamped to shape. The end-compartments were glued and clamped, not forgetting the two outside pieces for the handle. “I used cigar box wood, dried under weight in a cool place, to keep it from warping, and Casco glue made by the Casein Mfg. Co., of America, Inc. I finished it with one coat of Marshall-Wells Liquid Wood Filler, “535” (light) and three coats of varnish. The second prize winner was Floyd S. Good of Greenville, Ohio, who constructed a table lamp â€” even to the shadeâ€” from light and dark cigar box wood. “I first secured the cigar boxes, and dried them out thoroughly before taking them apart. I then cut strips from the lids and bottoms, the entire length of the wood, and glued them together; so that a square tube was formed, twice the length of a lid, by using two wooden pieces on opposite sides of the square tube, and three pieces on the adjacent ends. (One of the strips is cut across at the half-way mark, so that two sides of the tube will have a half strip, then a full strip, followed by another half strip. In this way, the joints do not come together.) The inside diameter of the tube is about 3/8″. Wood was then built up around the square tube thus formed, in exactly the same manner, until the post had an outside diameter of 2”. Alternating dark and light woods were employed in making up the post, which was then turned on a Delta lathe. “The base was made of alternate layers of dark and light wood, with the grain running at right angles in each layer; it is nine thicknesses deep, glued with Casco, under pressure, then turned. The post is secured to the base with glue and dowels, also made from cigar-box wood. “I soaked the whole cigar boxes in the following solution: 14 quarts of water at temperature 180Â° F. and 1 pint of wood alcohol. The reason I used alcohol in water is because alcohol penetrates through the paper very quickly. “After soaking for about ten minutes, the boxes are taken out of the liquid; the loose paper is scraped off and the whole boxes are put away for three days. I find this method best; it sure does prevent warping. When boxes are perfectly dry, they are taken apart and sandpapered. “In building the upright pole, I cut pieces three inches wide and box length, and kept building up until I had apiece 3x3x22 inches. After glueing them together, I applied the clamps for at least twenty-four hours. Top and bottom pieces were assembled cross-wise grain, also glued, and put away for twenty-four hours. “When pieces were dry, I put them on the lathe and turned them out. It will be remembered that N. N. Nicholson won the third prize in the previous contest. Although his construction this month was much better than the one last month, he stepped into the fourth place; because three other constructions were considered by the judges to be better than his. Anyone looking at the photograph of the model will agree that the cabinet work is superb. The article is finished in natural wood, without paint covering the beauty of the polished wood. 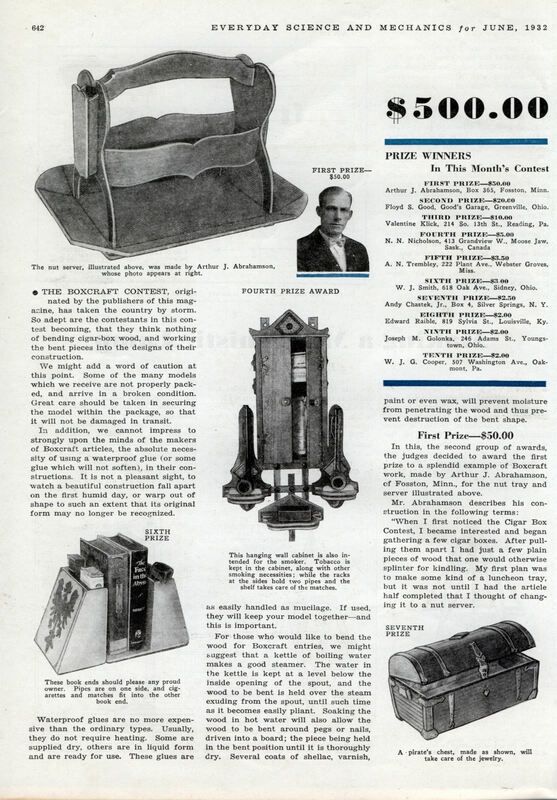 The fifth prize was given to A. N. Trem-bley, who is in the real estate business at Webster Groves, Mo., and, being rather fond of contract bridge, built this smoker’s tray for the bridge table. It holds three different brands of cigarettes, and matches; and it has a metal ash tray fitted into a pivoted wood shelf, so that the tray may be turned into the combination. This article is painted with Duco; the silhouettes were added just before a final coat of varnish is applied. This is a utility combination for the den, comprising two book-ends and a cigarette dispenser, -all painted in blue with black silhouettes; the entry was made by Mr. W. J. Smith of Sidney, Ohio. One of the book-ends provides two receptacles at the top, one for matches and the other for a package of cigarettes or small cigars or a small tin of tobacco; the other serves as a pipe rack, having two openings in the top for pipes. The cigarette dispenserâ€”not shown, but conform ing to the same general style and decorative effect â€”delivers one cigarette each time when the drawer is pulled out. A silk-lined casket for jewelry, in the shape of the proverbial pirate’s chest, was constructed by Andy Chastek, Jr. of Silver Springs, N. Y., and took the seventh position in this month’s contest. The sides and bottom of the chest are made from solid pieces of wood, grooved with a marking tool. The top is made in thin strips, slightly less than 1/4″ wide, and fastened to curved end pieces to give it a round form. The box is banded with hammered copper and hinges, the corner braces and clasp being made of the same material. Edward Raible, winner of the first prize in last month’s contest, clicked again this month, but he is quite far down in the list of awards. Nevertheless, his construction is worthy of more than passing notice. The wood for the picture frame and uprights is finished natural. A large sewing cabinet, entered by Mr. Joseph M. Golonka, Youngstown, Ohio, was awarded the ninth prize; while the tenth prize went to Mr. W. J. G. Cooper of Oakmont, Pa., for a match dispenser which delivers one match at a time, whenever the hopper is raised and lowered.